If you wish to visit Iran as a tourist you must have a valid Iranian visa that you can apply for at one of the Iranian embassies in the world for tourist visas or after your arrival to Iran at one of the international airports (faq) for visa on arrival. No matter which visa process you choose you must first get a so-called Iran Visa Reference Number or Iran Visa Authorization Code or Iran Visa Grant Notice that is being issued by Iranian Ministry of Foreign Affairs in Tehran based on our agency’s application. You can get your visa authorization code only through a verified agency and once you get it you can start your visa application process at the embassy or after your arrival to Iranian airport. The authorization code basically means that you have been verified by the Iranian ministry and a visa consul can issue a visa for you. You have to get your visa before this document expires. VISAnGO works with many visa agencies around the world and Touran Zamin based in Tehran has been our reliable partner in Iran for many years. Because of their personal connections to the ministry and our customer servise we can get results in situations where other visa agencies simply fail. Based on our longterm agreement with Touran Zamin you can easily apply for your Iranian visa reference number through our website and you will get our superb customer service and comfortable and quick payment method through Paypal at no additional costs. VISAnGO can apply for an Iranian visa authorization code or reference number on behalf of citizens of ALL countries EXCEPT FOR Colombia, Somalia, USA, United Kingdom, Canada, Bangladesh, Jordan, Iraq, Afghanistan, Pakistan and India (since Mar. 2014). We are sorry but there is no negotiation in that. Please note, Thursday and Friday are Iranian weekend days. We guarantee that if you apply for your code in the express regime your application will be presented at the Ministry in Tehran the very same day we receive your payment. Then it is up to the officers at the Ministry how fast they process your application, usually it takes 3 working days. Cancellation fee is 50 % if we have not yet started processing your application. After that is 100 %. Fill out and submit the form, see the link below. 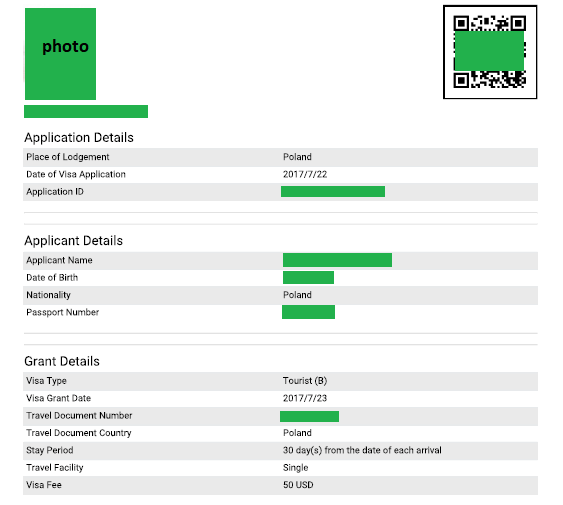 The form is very simple but please notice, you also have to attach a photo or a scan of your passport as this is one of the requirements imposed by the Iranian Ministry of Foreign Affairs. We assure you that your personal information will not be handed to a third party or used in any other dishonest way. We keep our moral standards high. After you submit the form you will be redirected to our payment gateway with PayPal in order to pay for your application. You will also receive an email from us that summarizes your application details and contains a link to our payment gateway with Paypal in case you would like to pay later. Once we receive the payment from you, we will check and pre-screen your application and if we are satisfied with it we submit it to the Ministry. You will certainly hear from us in case we have to clarify any information you did or did not provide in the application. You will receive your Iranian visa authorization code or reference number in the email within the ordered processing time. If there is a problem with your application we notify you too. With Iranian visa authorization code in your hands you can now approach the Iranian embassy you specified in your application (an Iranian embassy at home or abroad, an Iranian airport) and apply for visa. If you require more information, please first take a look at Frequently Asked Questions that relate to Iranian visas. If you did not find what you were looking for, contact us. Actual information regarding Iranian visa process should be available at the website of appropriate Iranian embassies abroad. Please click on Standard or Express procedure below.